Wandesforde House was built in 1824 by the Duchess of Ormonde as a school for children and is now a charming and relaxing country house B&B. Michael and Anna McDonald have transformed this historic setting into a comfortable country retreat, where you can come to relax and unwind in peaceful surroundings. If you don't fancy the hustle and bustle of Kilkenny city itself, this country location is an ideal base from which to visit the city and the scenic Kilkenny countryside. 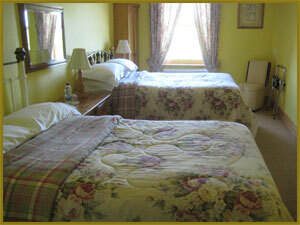 All our bedrooms are en-suite and spacious. Guests are welcome to complimentary tea and coffee throughout their stay and we are delighted to recommend a number of local favourites for food and drink. Wandesforde House is only 5 minutes from Castlecomer town and 20 minutes from both Kilkenny City and Carlow. We are extremely proud to have been awarded a recommendation in the prestigious Georgina Campbell's ireland-guide.com for 2011. Thanks to those patrons who took the trouble to nominate us.